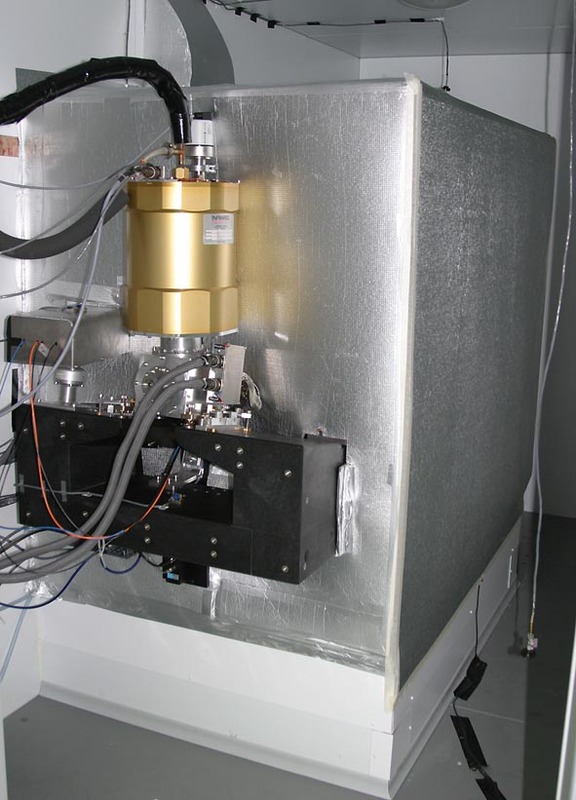 The instrument is located inside a thermally-controlled chamber whose temperature is maintained constant to within 0.01 degrees. The four gray sheaths containing the 17-m long optical fibers coming from the telescope arrive into the chamber at the top left. The metal box at mid-left (partially hidden) contains the scramblers for the high-resolution fiber set. The fibers (one blue, one orange and two black) enter the spectrograph below center left. The (golden) dewar holding the EEV 44-82 CCD (4102x2048 pixels) has an autonomy of 48 h, but is refilled automatically every 24 h through the black tubing at top left. The tank seen in the background contains the dispersive elements has been sealed and is filled with Nitrogen. Its pressure is constant to within 0.01 mbar. Light enters the vessel through the Schmidt corrector (held by the black circular plate). See the optical layout for more details. The entire spectrograph is mounted on shock absorbers and is directly supported by the telescope pier structure. The cover assembly was installed at the end of December 2006. 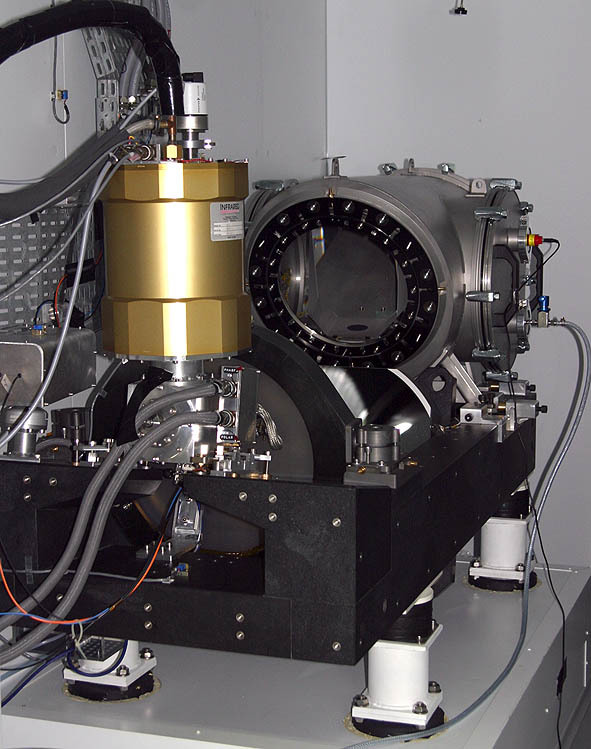 It is made from insulated foam and shields the spectrograph from thermal turbulence within the chamber, reduces stray light and protects the mirrors from dust. It is now expected that the thermal stability of the spectrograph will be better than 0.01°. Two sides of the cover (right side and back) can be opened for access to SOPHIE. The cables running on the ceiling, on the floor and hanging on the extreme right gather data from various temperature sensors installed outside and inside the cover.